Collections are the groups of web products that are displayed to customers. 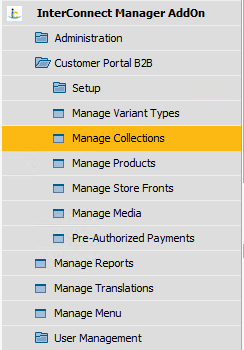 Collections are managed in SAP Business One. Go to: InterConnect Manager AddOn - Customer Portal B2B - Manage Collections. Add or edit a collection by pressing the + button or golden-arrow link. A collection may be deleted by selecting that collection in the list and pressing the - button. Existing collections are displayed, and new collections may be added using the + button. Configure collection details, as described below. Configure collection details as described below. The Admin-friendly name for this collection. This is not displayed to customers. Select the language to define which language these details apply to. Each language may have distinct details and images for a product. As such, when configuring a web product, those details are only configured for the selected language. Web Name is a customer-friendly name for this web product. It is displayed to customers on the web. Provides mouse-over text for collection links. Description text is optionally displayed on collection pages. Use the golden arrow to open the HTML Editor, or edit the field directly. This will be displayed on the web as HTML-formatted content. This is the main image displayed prominently on the collection page. You may use the golden-arrow drill-down to open the media manager and select an image. Alternatively, you may type in the known path relative to the web root (for example, /assets/B2B/collections/my-collection.jpg). products.liquid - Product Collection - this option is appropriate for product collections that are linked from menus. search.liquid - Product Search - this option is appropriate for search collections and are not typically linked from the menu. Optional properties based on the template can be configured to dictate how that template is used by this collection. This allows for multiple variations within a single template. Select the preferred default sort for this collection. 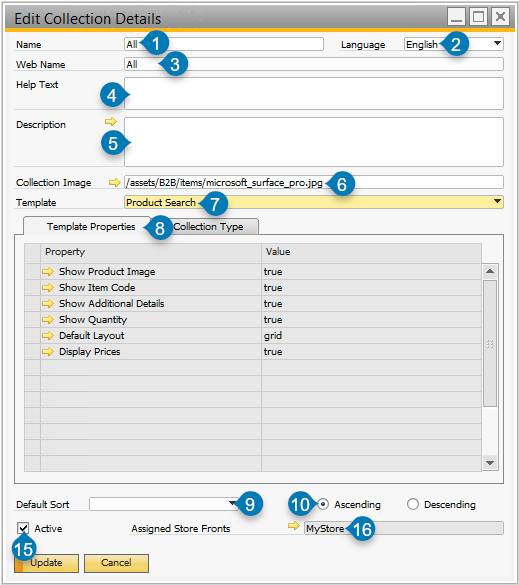 Customers may change the applied sort while they browse once a collection is loaded. Select the preferred sort order. Customers may change the sort order while browsing once a collection is loaded. Smart: Use a Filter to determine which items are displayed in this collection. User Managed: Define a specific list of products. Search: Allow search results to populate this collection. This is used to identify display details related to search. Add or remove filters using the +/- buttons. Filters are used to restrict the parts that are displayed in this collection. For example, filters can be set on tags, B1 Item Group, or other properties. Multiple filters may be applied to a Smart Filter. Add a filter. 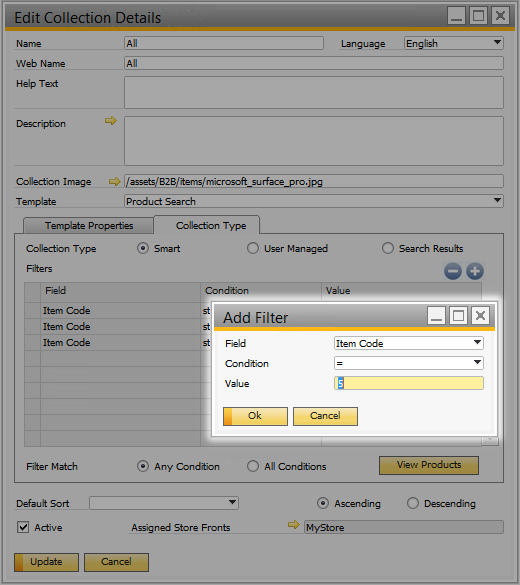 Select the filter Field and Condition. Set a value. Press OK to apply. Any Condition: if an item matches any filters, it will be included. All Conditions: an item must match all filters to be included. This opens a list of all items that match the current filter. If enabled, this collection will be accessible. If disabled, this collection will not be displayed in any menus, and it will not be accessible via direct links. Specify which Store Fronts this collection belongs to. If a user has that Store Front, the user will be able to see the collection. 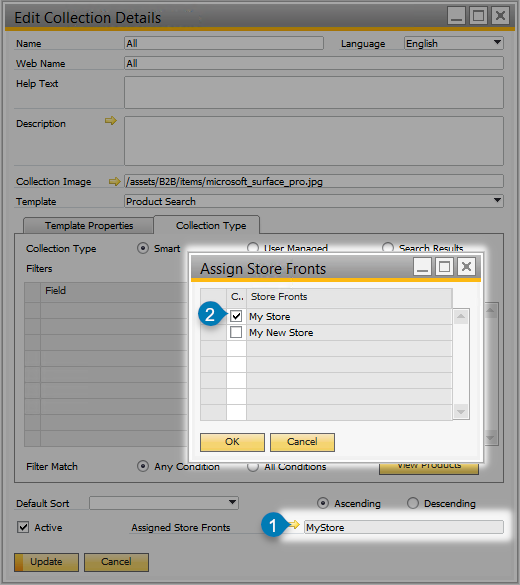 Use the golden-arrow drill-down to open the “Assign Store Fronts” window, shown below. Check off any Store Fronts that should display this collection. Press OK to apply the filter. Check off all Store Fronts that should display this collection. Press Add or Update to apply collection settings. Assign the collection to a menu entry (not applicable to Search collections) if the collection should be displayed on the web. 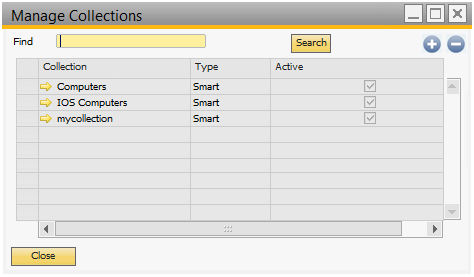 See Menu Management for Customer Portal for a walkthrough of configuring menu entries.